Mother's day jewelry from KAYA, for the sweetest mom! The names of her children engraved in a beautiful piece of jewelry. 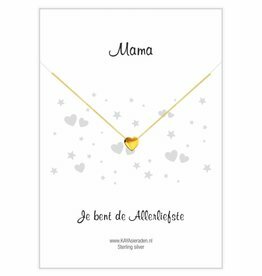 It is a huge trend, giving a beautiful, personal gift for Mother's Day . In order to symbolize the special bond and to always have your children close to you, KAYA is sure to succeed for a mothership. The jewelry is all made of real silver, gilt gold and Swarovksi crystals. Also have your story captured in one of these beautiful mommy jewelry. 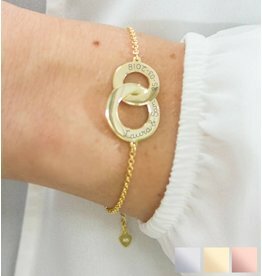 This bracelet with two infinity symbolizes eternity and continuity. Show eternal friendship or love for the special people in your life with an infinity sign for each person. Two hearts intertwined in each other, symbolic gift for a proud mama! With precision we engrave the names and dates of birth of your children, or 3 or 4 kids names, or you and your lover's name (+ your special dates). Fathers and children, pay attention. If mommy does not take a look now, we give the best tip for Mother's Day 2018 . Give her a necklace from the infinity line, an infinity necklace that establishes the infinite bond between you. Do they bet that, besides the beautiful drawings, the warm croissants and the fresh coffee, loves to get ?! Make the jewelry personal by having a name, birth date or special word engraved in it. Success assured for upcoming Mother's Day! 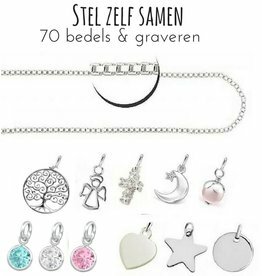 For little girls who want to resemble mama, KAYA designed special mother daughter bracelets. Do you already proudly see her wearing her bracelet together with Mama! Or how about a silver text pendant with popular texts like 'the love between mother & daughter is forever. Or 'I love you to the moon & back'. With these Mother's Day gifts, you're sure to be good and give the best gift!